Want to start your day off with a healthy meal that won’t leave you hungry again before lunch? Well, try our overnight oat groats. Overnight you say? But it’s breakfast, right? That’s the beauty of this recipe. You start it before you go to bed, and in the morning you just heat, eat, and go. Try it with fresh berries, yogurt, honey, or whatever your taste buds tell you sounds good. Want to start your day off with a healthy meal that won't leave you hungry again before lunch? Well, try our overnight oat groats! The night before, bring water to a boil on the stovetop in a medium saucepan. 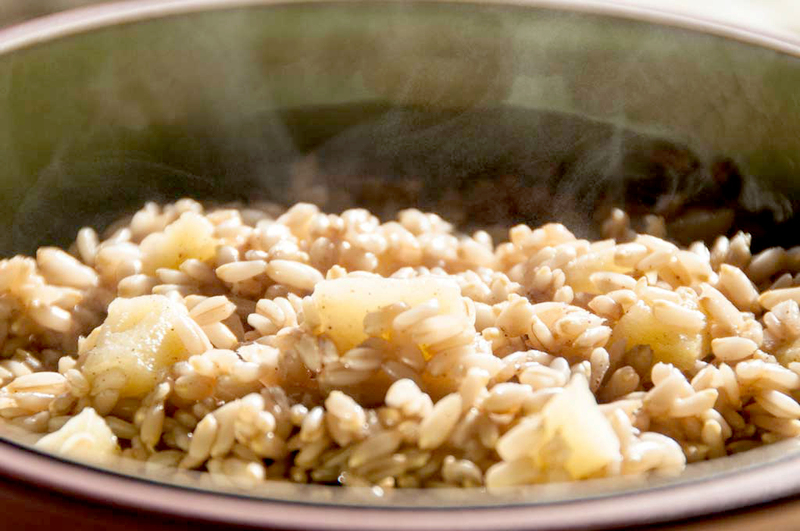 Add oat groats, cover, and return to a boil for 1-2 minutes. Remove from heat, cover with lid, and go to sleep. In the morning, heat the overnight oat groats over medium heat, stirring occasionally for about 5 minutes or until heated through and no water remains. Add your peeled apple and cook over low heat until apple softens. Add butter (if using), brown sugar, and cinnamon to the groats and stir to combine. In the morning, transfer the overnight oat groats to a microwave safe bowl. Add your peeled apple, stir, and microwave on high for 3 minutes. I don’t have a microwave. How long should I cook it on the stove? Sorry for the delay. Do you have a rice cooker? That works great. Otherwise – bring to a boil on the stove, then reduce heat and simmer for 40 min. For overnight, simply bring to a boil, then remove from heat, cover overnight. This looks so yummy..Awesome recipe !! Thank you! Very easy to follow instructions! Overnight Oat Groats , my new favorite! Used your recipe (except did all the cooking in the microwave) & it was delicious! Now am “playing around” changing spices, fruit and liquids. FABULOUS! Can you just soak Oat groats overnight and eat it the next morning? Or do you have to cook it first? Is it possible to make a granola from oat groats by boiling them first and then bake in over after stirring in maple syrup, honey, nuts and seeds etc? Will it be crunchy enough if baked at about 140-150°C for about 30 minutes? Absolutely. I could them in a rice cooker too. So simple. Then simply add your syrup etc. I think that would work better than baking – as they need a little moisture to soften. What is the difference between oat Groats and steel cut oats? The oat groat is the whole seed of the oat plant. Steel cut oats are oat groats that have been cut. Our unique variety of oat groat is very small and looks and cooks just like rice. It is also raw and sproutable too. We have been eating overnight oats every morning for 3 years. We buy our oats in 50 pound bags delivered to the door by Amazon and drag the bag to the pantry. We use a rice cooker and cook for one hour and just keep them in the pot. Next morning they are cooked and cooled down. We break up the cooked groats . We add cut up apples or bananas or whatever and add lime juice from one lime. I am a male over 70. I lost 40 pounds, groats fill you up . Sounds delicious. Thanks for sharing. And this is how we prepare our groats too. But I’ve never added lime. I’ll try that. Do you buy our Groats?